We've got some fun and educational prizes lined up for the lucky draw at tonight's Web Wednesday networking event (6:30pm - 9:30pm at Volar in LKF). 1st Prize: 7 days of Groupon HK coupons (the main deal as they have three per day). Blog about your experiences and you get another 3 days of coupons free. 3rd Prize: Lunch at the Four Seasons Hotel with Danny Yeung, CEO and founder of Hong Kong's hottest internet start-up! 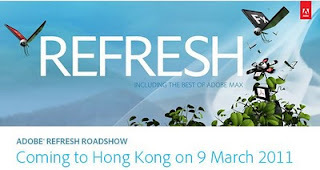 Adobe is also generously offering each winner a set of tickets to their upcoming event, "Refresh Roadshow" on 9th March at Cliftons in Central. You can also sign up here.